With the commencement of the NSW Biosecurity Act 2015, we say goodbye to a number of previously existing acts that have governed NSW producers and their practices for decades. Regulations have also been reviewed and new ones made to support the Act. 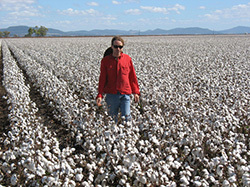 There are more than 1200 cotton farms in Australia and roughly half of these are in NSW. The Australian cotton crop is worth approximately $2 billion annually, underpinning the viability of 152 rural communities. Good production practices are important to protect the industry from pests, diseases and weeds both endemic and exotic. The new biosecurity framework will help safeguard our economy, environment and community from biosecurity risks. Prohibited matter is listed in Schedule 2 to the Act and includes matter that could have significant adverse consequences to the economy, environment or community. A number of important pests, diseases and weeds across horticultural industries are listed as prohibited matter. Schedule 2 to the Act should be consulted for up‑to‑date prohibited matter listings. It is an offence under the Act to deal with prohibited matter. Presence, or suspected presence, of prohibited matter in NSW must be reported to NSW DPI immediately. The general biosecurity duty supports the principle of shared responsibility. It means everyone should be doing what is reasonable for them to do to prevent, eliminate or minimise biosecurity risks. As a key stakeholder in the NSW cotton industry you have a responsibility for protecting your industry from biosecurity risks you may come across in your day to day activities. As the general biosecurity duty is outcome focused and not a prescriptive regulation, growers have greater flexibility in determining the management arrangements that best suit their operation. ‘Discharging’ your general biosecurity duty generally provides that your production practices contribute to the protection of the industry as opposed to exposing it to risk. If you are undertaking practices that directly expose the industry to biosecurity risks there can be implications under the general biosecurity duty. To protect yourself and your industry, NSW DPI encourages good biosecurity practices in line with the cotton industry myBMP biosecurity module guidelines. The following scenarios provide some guidance as to how the general biosecurity duty may apply in biosecurity risk situations you may come across. Suggestions made here can be incorporated into a personalised farm biosecurity plan to protect your property and business. An unusual symptom or pest could potentially be a new threat not previously faced by the industry or region and could be a potential biosecurity risk. If identification confirms a pest or disease of concern the NSW DPI will advise you on how to proceed and any restrictions that may apply. There is a biosecurity risk associated with field day attendees introducing new pests, diseases or weeds to the host property. The host property itself is also a biosecurity risk for attendees as there may be pests, diseases or weeds already present that aren’t present on their own property. On leaving the field day, be aware of risk material you might be taking with you (eg soil, plant material, pests, disease particles, weed seeds on vehicles/equipment/clothing). All material taken with you should be assessed for risk and preferably cleaned before re-entering another production area. There is a biosecurity risk associated with contractors introducing new pests, diseases or weeds to the property from other regions. The general biosecurity duty applies to contractors who are reasonably expected to know of the risk they represent. Growers who ensure their contractors are aware of biosecurity risks and give guidance as to how to prevent, eliminate or minimise that risk impart on them the general biosecurity duty. Consultants who move from property to property within a region are a risk for spreading pests, diseases and weeds. If available, use on-farm wash down facilities to wash vehicles, machinery and/or equipment before exiting the property. If wash down is not possible on the property vehicles, machinery and/or equipment should be cleaned elsewhere before entering the property. If such a situation occurs the grower is expected to take reasonably practicable steps to ensure spread of the pest, disease or weed is prevented, eliminated or minimised. It is important to remember though, the Act is underpinned by regulations that require specific action in relation to pests, diseases, weeds and contaminants – these may not necessarily be directly linked to cotton. For example, there are requirements to notify the presence of certain weeds and, some machinery and equipment cannot be imported from Queensland unless certain conditions are met to remove the risk of parthenium weed. You should familarise yourself with the Regulation to ensure you are compliant. More information can be found on the NSW DPI webpage or our weeds fact sheet. Pests and diseases already being managed in Australia can create new threats if new exotic strains are introduced from overseas. Exotic strains present overseas can be more damaging, have greater resistance or be carrying exotic diseases. An exotic plant pest is a disease causing organism or an invertebrate (insect, mite, snail, nematode) not present in New South Wales which damages plants or plant products. If you suspect the presence of an exotic plant pest or disease, or if you see unusual symptoms on your plants, please phone Exotic Plant Pest Hotline 1800 084 881. Subscribe to NSW Plant Biosecurity News to receive regular updates and announcements regarding plant biosecurity issues. Tools, tips and manuals to help you implement farm biosecurity on your property.